Note: This is a guest post from a new foodie blogger friend, Lisa Fine. 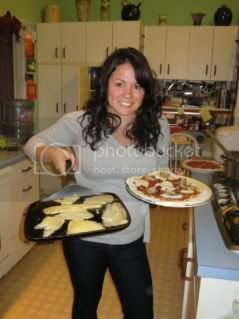 Check out her healthy variation of flatbread. One of my favorite places to visit for a long weekend is Montreal. Only four hours away from my home in the Berkshires of Massachusetts, this Quebec city is full of narrow streets to wander through, and delicious food to try. The great thing about making flatbreads is that they require no yeast. If you’re curious about bread-making but are scared of using baker’s yeast properly, flatbreads are a easy way to start. When making this recipe, you can either you a premade trail mix, or concoct your own by mixing together your favorite seeds, nuts, and dried fruit. If you’re using larger-sized dried fruit, like apricots or dates (anything bigger than a raisin, really) chop them into small pieces. 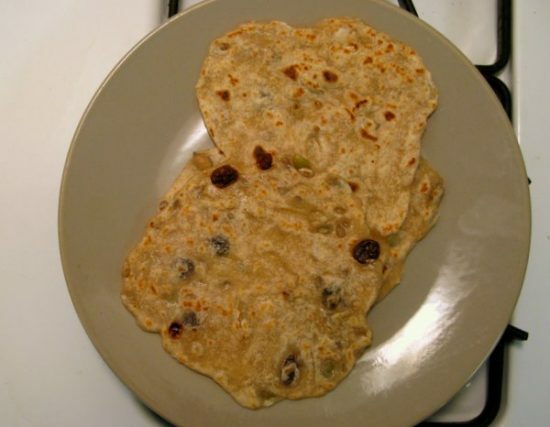 Avoid trail mixes with chocolate though, since it can burn when you cook the flatbread. But if you’re craving chocolate, use it as a topping instead! This recipe is adapted from King Arthur Flour’s Picnic Wraps. In a medium-sized bowl, mix together the flour and oil. Gradually mix in the water and salt. Mix in your trail mix, and knead the dough briefly, just until the dough is smooth. Divide the dough into eight pieces. Round them into balls, flatten slightly, and allow them to rest, covered, for at least 30 minutes. Preheat an ungreased heavy frying pan over medium heat. Working with one piece of dough at a time, roll it out onto a floured surface until it’s about 8 inches in diameter. Fry the wrap for about 45 seconds on each side. These flatbreads are delicious rolled up with hummus, cheese, and tomato; or topped with avocado, cream cheese, nut butter, or chocolate spread. They make a great addition to breakfast, lunch, or dinner, or are delicious as a snack, on their own. 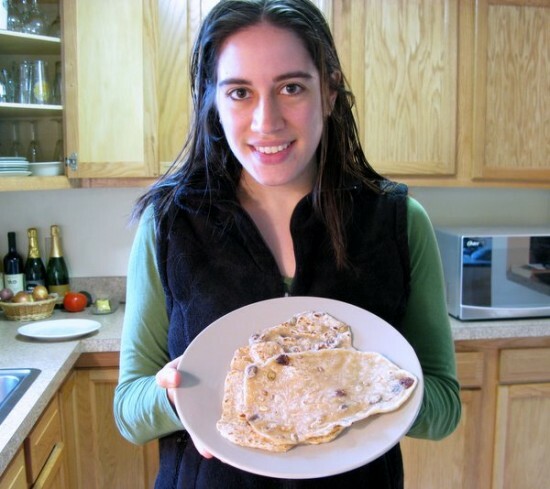 Bio: Lisa Fine is the writer behind Lisa’s Foods on the Move, a travel and healthy food blog. She loves to share new recipes and food finds, and share her passion for farmers’ markets, farms, traveling, and running. You can also find Lisa’s work in her Etsy shop, where she creates recycled paper products that are inspired by local and organic foods. Another great thing about flatbread for readers in Colorado: no leavening = no worries about recipe adjustments. Versatile too. Great call, Bing! I asked Lisa if she could add a bit about altitude and baking but she mentioned the same thing. We’re all in the clear. Thanks for the comment! Thanks again for setting up my guest post, Grace. I figured it’d be helpful for your Colorado readers to have different bread options when baking in high altitudes. And it is really versatile – you can add all kinds of mix-ins, or just make it plain. Lisa! Thank you. It’s such a great healthy alternative 🙂 Thanks for posting and keep on popping by. Ooh this looks great! Thanks Lisa Fine!!! Isn’t it? I love the healthiness of it.